This is a generic guide for connecting your workers to your HASH Scheduler(s). It is not specific to any mining hardware which makes it more or less intended for knowledgeable miners. Login to Stratumsphere and locate your HASH Scheduler under the Schedulers. Click on your scheduler. In the Overview page on the bottom you should see Worker Connection Details. On your worker of choice, use Primary Stratum as the main mining pool entry and Secondary Stratum as the failover mining pool entry. DO NOT set your wallet or mining pool account as you would on a normal mining pool when not using Stratumsphere. Our system handles that for you whether the miner ends up on your personal pool or the end-user&apos;s rental mining pool. You simply need to treat the user or wallet address entry that you would normally use as the worker name. Worker names cannot have any . or special characters like !@#$%^&*(). We suggest that you keep it simple with letters, numbers and dashes -. It is suggested that you choose a unique worker name that makes it easy for you identify and find the worker within your facility so you can utilize Stratumsphere&apos;s monitoring capabilities. A good example of a worker name that&apos;s easy to find within a facility would be S9-RowA-Rack1. x is the default worker password and is required. Once the mining software is started and starts initializing you should see a successful connection to Stratumsphere. It will look just the same as any other mining pool with work being received and valid shares being submitted. Your worker should appear on your HASH Scheduler&apos;s worker inventory after several minutes. That&apos;s it, you should be done! Here are some important points you should be aware of with workers that are connected to Stratumsphere. 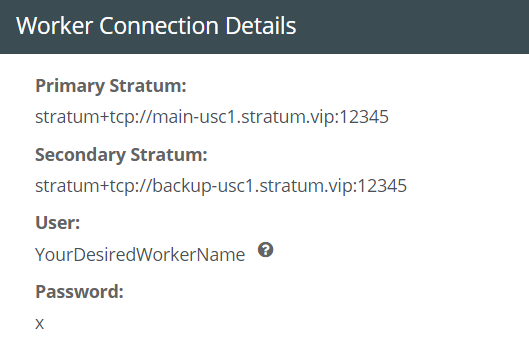 Stratumsphere requires a stable internet connection. Frequent disconnects/reconnects will trigger flood protection on the scheduler and deny new workers. Restart your scheduler from the overview to reset this protection. There is nothing wrong with setting an outside mining pool for your third failover option on your mining software. Stratum is required! getwork is not compatible with Stratumsphere (it&apos;s in the name ).